1 of 3 Place graham crackers in large plastic food-storage bag; seal. Crush with rolling pin until coarsely crumbed. Place almonds in food processor; process until finely ground. Add sugar, melted butter and crumbs; pulse until well combined and crust begins to stick together. 2 of 3 Press crumb mixture over bottom and up sides of 11 x 7 x 1-1/2-inch rectangular baking pan. 3 of 3 Bake in 375 degrees F oven for 8 to 10 minutes or just until crust begins to brown around edges. Remove pan to wire rack and let cool. 1 of 4 Combine 2 cups blueberries, the sugar, cornstarch, water, lemon juice, nutmeg and almond extract in medium-size saucepan. Cook over medium-high heat, stirring, until mixture is clear, blueberries pop and mixture thickens, about 10 minutes. 2 of 4 Pour blueberry filling into baked crust, spreading to edges. 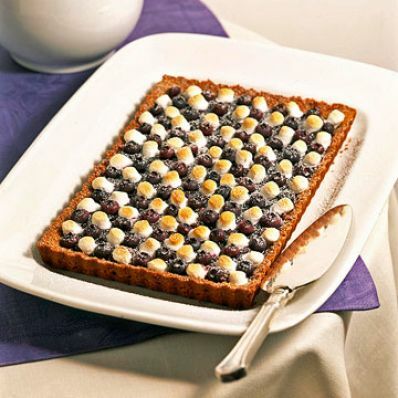 Arrange remaining 1 cup berries and the mini marshmallows in an alternating checkerboard pattern over top of tart. Cover with plastic wrap and refrigerate until ready to serve. 3 of 4 Remove tart from refrigerator 30 minutes before serving. Heat broiler. 4 of 4 Watching carefully, place tart under broiler just until marshmallows begin to brown, 1 to 2 minutes. Remove from oven. Remove side of pan and serve immediately. Make-Ahead: Crust can be made ahead and stored at room temperature for up to 1 week. The tart can be assembled and refrigerated a day ahead. Per Serving: 3 g pro., 311 kcal cal., 114 mg sodium, 3 g fiber, 6 g sat. fat, 23 mg chol., 13 g Fat, total, 49 g carb.